Not all habits are equal. You have simple ones, like brushing your teeth or kissing your spouse before heading off to work. You have complex ones that often require constant willpower, like avoiding certain foods or exercising every day. And in between, there are the small habits that have a positive (or negative) compounding effect on your life. The mistake people make is they don’t take the time to understand what it takes to build habits. Some are easy to master, like the three-minute habit of writing down your daily goals. Others are extremely difficult to make “sticky,” like a thirty-minute exercise habit. You’ll soon discover that most of the habits included in this book are support habits, but you need to understand the difference between each so you can pick the right ones for your situation. Keystone habits are a powerful concept that Charles Duhigg discussed in this book The Power of Habit: Why We Do What We Do in Life and Business. Simply put, a keystone habit can have a positive impact on multiple areas of your life—even if you’re not intentionally trying to improve them. A common example that people use is a thirty-minute daily exercise routine. Let’s say you start running to lose a few pounds. As you get fitter, you subconsciously start to avoid fatty and sugary foods, so your weight dramatically decreases. This improves your self-esteem, which creates a positive change in both your relationships and your career (because you now feel confident enough to ask for a raise). On the surface, all you did was exercise for thirty minutes every day, but the addition of this single habit caused a chain reaction of positive results. That’s the essence of a keystone habit—it’s a single change that produces a positive trickle-down effect in other areas of your life. Now, the reason I used exercise to explain this concept is because it has always been one of my major keystone habits. In fact, it’s also the example that Duhigg provides in his book. There are many varieties of keystone habits. Some require a lengthy commitment of time (like thirty to sixty minutes daily), while others only take a few minutes to complete. There are many examples of great keystone habits that can include meditating, tracking your expenditures, planning your day, and scheduling regular meals with your family. As you can see, some of these might only require a few minutes of your time, while others require longer than an hour. So therein lies the problem. Since we all have a limited amount of time, it’s impossible to continuously add thirty-minute blocks of new activities to your already busy day. Eventually, you have to choose the habits that are most important to you and make sure they get completed before anything else. Allow me to briefly review each of the five to show why they’re important. 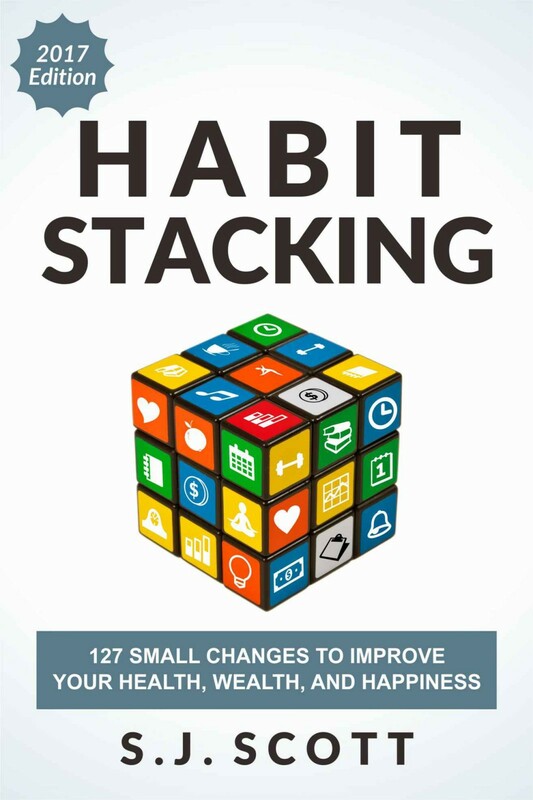 Habit stacking enables me to consistently complete all the support and elephant habits that we’ll talk about throughout this book. These are the small activities that are important but impossible to consistently remember without a reminder (like journaling, reviewing my goals, and drinking thirty-two ounces of water to start the day). Writing is the cornerstone of my online business, so it impacts my income, personal fulfillment, and relaxation. The more writing I can do daily, the more “in control” I feel about my daily routine. Finishing three work-related tasks is another keystone habit related to my business. After writing, I’ll look at current projects in my Todoist app. The goal here is simple—I identify and complete the next tasks to move these projects forward. Sometimes, a task only takes a few minutes to complete. Other times, it’ll require a few hours. The important thing (for me) is to consistently make progress on these time-sensitive projects. Exercising has a positive impact on every area of my life. When I consistently work out, I feel happier, more relaxed, and more productive. Sure, this activity requires a daily commitment, but it also helps me achieve goals in all seven of the categories that I mentioned in the previous section. Reading nonfiction has a positive impact on both my business and creativity. I find that the more I read, the more I’m able to come up with interesting ideas to include in my writing. Basically, it’s a case of quality in = quality out. All five actions are my personal keystone habits because they benefit all the areas of my life. The total daily time I spend on them is three to four hours. Yes, that might seem like a lot of time for habits, but I feel that I accomplish more during this time than most people can do with their standard eight-hour workday. If you’d like to build keystone habits into your life, then I recommend getting started with the ones identified as such in Parts V through XI, where we go over the individual habits. Or, if you want a quick shortcut, then I recommend checking out the list of keystone habits listed in the free companion course. These cleverly titled habits do exactly as they are described—they support the achievement of an important keystone habit. I’ll admit that the difference between these two concepts might be confusing, so let me give you a quick illustration of how they differ from one another. 1. Check the weather forecast to see if I need to exercise outdoors or at the gym. 3. Pack my exercise clothes in the morning before leaving the house (just in case I decide to go to a Starbucks coffeehouse in the afternoon). 4. Drink sixty-four ounces of water to make sure I’m properly hydrated for my runs. 5. Weigh myself each morning (during marathon-training season). 6. Record each run in my Runner’s Log app. 7. Wear my Fitbit to count my daily steps. As you can see, many small actions and decisions are made each day just to make sure I complete an exercise routine. Each only requires a minute or two of action, but they’re just as important as any other habit because they eliminate those excuses that people make when they skip a workout (e.g., “I didn’t pack the right clothes” or “I planned a run but didn’t know there would be a lightning storm in the afternoon”). Now, if I relied on memory alone to complete each of these seven actions, then I’d probably miss something important at least one day a week. But since all seven are part of my “exercise habit stack,” I can be confident that nothing will slip through the cracks. Never underestimate the power of support habits. While they only take a few minutes to do, they are the glue that holds together your keystone habits. The idea here is that whenever you’re faced with a large, complex goal, all you need to do is chip away at it in small chunks. You, on the other hand, can take any large project and chip away at it using what I call elephant habits. Elephant habits are designed to overcome the natural resistance that we all feel whenever we’re forced to do a potentially unpleasant task. You know it must be done, but you avoid starting because dedicating a few days to it sounds as fun as getting a root canal. Like the quote mentioned before, an elephant habit will help you complete a project one bite at a time. Elephant habits have a similar framework to the mini-habits concept that we’ll discuss later. When you tell yourself that a task “only” takes five minutes of your time, it’s easier to convince yourself to get started. And what usually happens is, once you get started, you’ll find yourself doing more of that activity than you originally planned. Well, that’s a brief overview of the three types of habits I’ll discuss in this book, so let’s start talking about what happens when you group together these small but important actions. Specifically, I’ll talk about two problems people have with building small habits and how habit stacking is the perfect solution for overcoming them.